Gurley gets an early Christmas compliments Karib Cable! 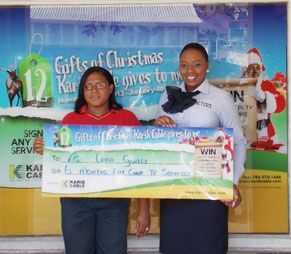 When informed that she was a winner, Gurley didnât believe her good fortune at first, but soon came to the realization that she is the first winner of Karib Cableâs Christmas promotion. Gurley upgraded her Cable TV service and kept her account up to date to qualify for the prize. âI feel real elated to have won and this could not have come at a better time. I now have an opportunity where I can enjoy six months of great movies and shows, compliments Karib Cable. Karib Cable launched the â12 Gifts of Christmas Karib Cable Gives to Meâ promotion on November 19. The telecommunications companyâs 2012 Christmas promotion will give customers the chance to win 12 gifts over a six-week period. Inclusive of the 3 main prizes, a Shopping Spree, (1) Flat Screen TV and a laptop computer, the company will also give away 2 surprise gifts each week for 6 weeks. In addition to the aforementioned prizes, customers who sign up for Internet and Cable TV services will benefit from free installation and modem. Customers signing for 2.2 Mbps – 8.8 MBPs internet service will not only get free installation and a modem, but also get a free wireless router. He also said the promotion â12 Gifts of Christmas Karib Cable Gives to Meâ is another way of rewarding and giving value to their customers. Edwards said that to ensure that all customers are eligible to win in this promotion, all customers signing up for any Karib Cable service, whether it be a movie package, Telephone Fixed Line, Internet or Cable TV service, will automatically get a chance to enter. The draw for the main prizes will be on January 4, 2013.